The email address for Space Base 8 is spacebase8@gmail.com. I’d love to hear from you. 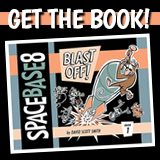 Send me your comments, ask me a question, tell me what you think of Space Base 8. Send me a guest strip or some fan art and I’ll post it on the site to share with all the Space Base 8 readers. Send me a sketch of a ray gun, robot, or rocketship. Send me to the moon, Alice! I am @cartoonsmith on twitter. Visit the Space base 8 page on Facebook. Like it! Do the Google Plus thing and circle me. Hey D, Greetings from Beijing. Just had a chance to check out some of the new SB8 work… great fun, bro. Quite a joy to read, thanks for the chuckles and guffaws. I hope all is well with you and your good lady wife.Peace out. P.S. I would buy one of those t-shirts as well.